Preparations for the 1900 World's Fair are in full swing throughout the city. Everywhere, scaffolding is being erected and tunnels are being constructed on the streets, to be sunken later. The construction of the Paris Metro system is underway! Content - Basic game: 1 game board, 60 track tiles, 61 subway tiles, 6 scoring markers, 1 rules booklet. 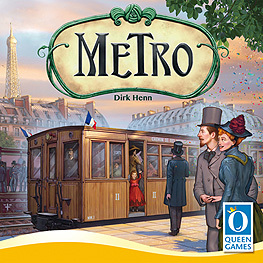 Expansions 1-4: 1 share board, 32 shares, 8 subway tiles, 2 scoring markers, 8 central station-subway tiles, 8 central station-track tiles, 32 station numbers.